Add the perfect decorative accent to your traditional styled kitchen or bathroom cabinetry with the Liberty 3 in./96 mm Dual Mount Palermo Pull. 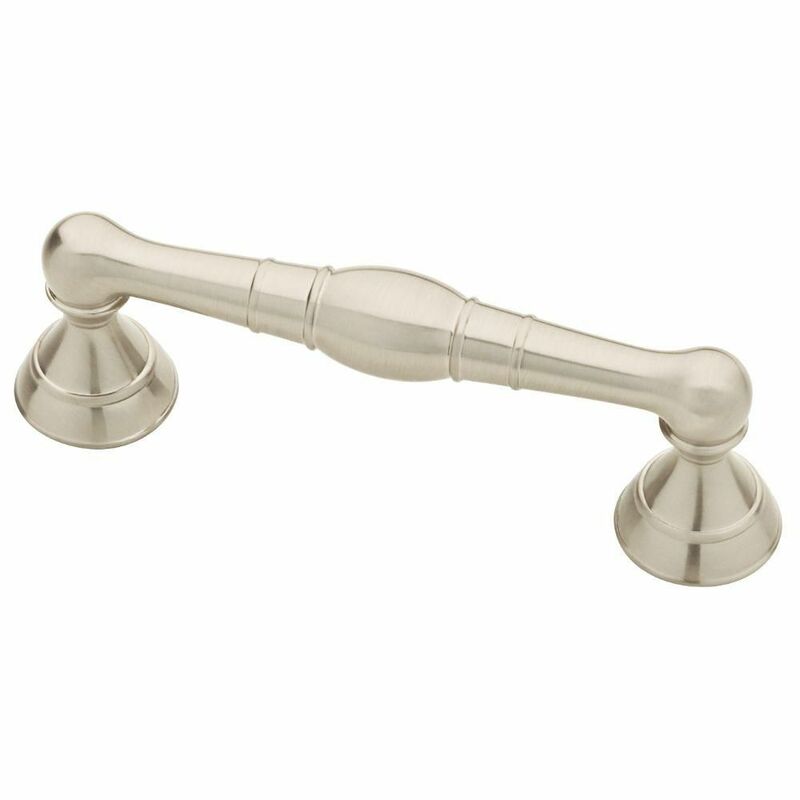 With its classic design and elegant Satin Nickel finish, this pull is sure to be enjoyed for years. The Liberty Dual Mount Palermo Pull features 3 in. or 96 mm center-to-center rear mounting. The Liberty 3 in. Satin Nickel Half-Round Foot Pulls features a casual design that works well with a variety of decor styles. The pulls are crafted with metal to help ensure strength and come in a handsome satin nickel finish for aesthetic appeal. Includes mounting hardware for easy installation. Boldly modern, the Caspian pull is inspired by industrial décor. Strong lines are accented by crisp details that make a statement. Ideal for both kitchen and bathroom décor. 3 or 3-3/4 Dual Mount Palermo Pull, 1 per package Add the perfect decorative accent to your traditional styled kitchen or bathroom cabinetry with the Liberty 3 in./96 mm Dual Mount Palermo Pull. With its classic design and elegant Satin Nickel finish, this pull is sure to be enjoyed for years. The Liberty Dual Mount Palermo Pull features 3 in. or 96 mm center-to-center rear mounting. 3 or 3-3/4 Dual Mount Palermo Pull, 1 per package is rated 5.0 out of 5 by 9. Rated 5 out of 5 by PRC from I ordered these drawer pulls for a bathroom remodel am very happy with them. They are very prett... I ordered these drawer pulls for a bathroom remodel am very happy with them. They are very pretty, rich looking and appear just as shown online. They were just installed so it's too early to tell how they will wear over time but they appear to be well made. Rated 5 out of 5 by Tracey from These handles are beautiful and the choice of 2 holes... These handles are beautiful and the choice of 2 holes on the back ensures they will fit with the different size of pre-drilled holes already in the cabinet door. Rated 5 out of 5 by Nancy from beautiful and classic door pulls I am remodeling a few rooms - these door pulls are going on our cabinets in our laundry room - very classic looking and reasonably priced. Rated 5 out of 5 by RBL26 from Great Looking Handles We remodeled our bath and went with brushed nickel finish everywhere. These handles look great, feel substantial and solid, and make our vanity pop. Rated 5 out of 5 by LadyJ from Beautiful handles Just purchased one to see if I liked the "look". Weighty, with nice detail for a Tuscan kitchen.Makes my old cabinets "pop". I especially liked the adjustable 3" to 3 3/4" adjustability, as I have 3 3/4" holes drilled for the old handles. Worth the price. Rated 5 out of 5 by lr225 from Good price-hoping for good quality too Love the look, can't wait to see them on my new cabinets. Expecting the performance to be lasting!!! !